We guarantee the quality before the item ships. We offer 45 days money back &1 years warranty. Three ear hook and six optional eartips (Small, Medium, Large) are included, for the best comfortable fit in either ear. Please try all eartips and choose the most comfortable one for your ear canal. Built-in Upgraded Mic, Reliable And Clearer Calls. High Quality Calling Performance Ensures Smooth Communication. All-around Voice Pick Up for Clear Crisp Sound Instead Of Muffled Sound. Connect with 2 bluetooth-enable devices at the same time, don't worry about missing calls when watching movies on ipad. Featuring maximum battery capacity (75mah) on market, supports up to 8Hrs working time. Time will tell everything. 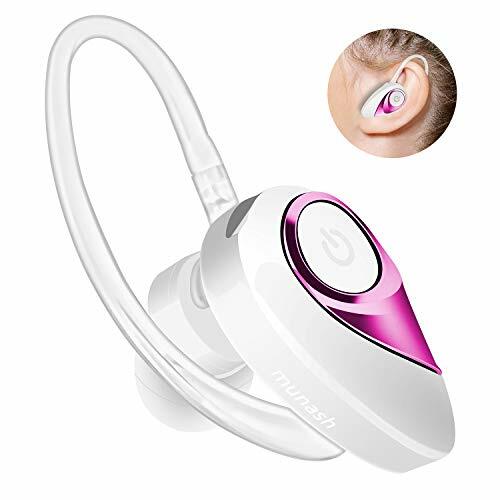 Make hands-free calls or enjoy music with Munash V4.2 Bluetooth wireless headset. Great product for drivers, businessmen, office workers and others. The Humanized design let you wear it several hours without pain. Please be sure to ensure that your purchased Bluetooth headset is purchased from the HANLIKEJI store. If you have any questions about this product by munash, contact us by completing and submitting the form below. If you are looking for a specif part number, please include it with your message.